Dr. Jo Handelsman: The Woman with Tiny Interests — What's Manju Doing? 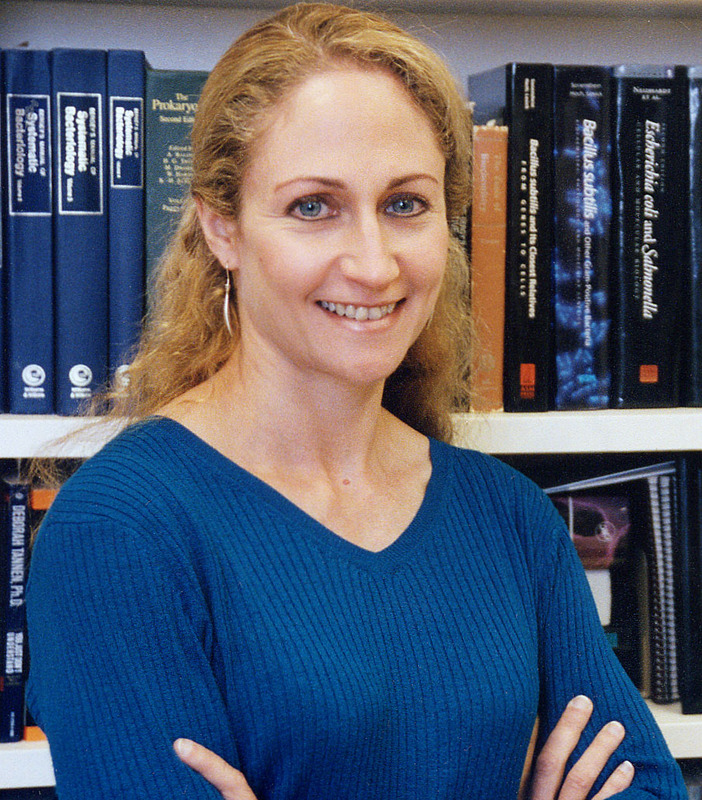 Dr. Jo Handelsman is the Associate Director of Science for the White House Office of Science and Technology Policy (OSTP). Her job is to work with and advise the President on matters of science policy and research. When she’s not running the nation’s science policy program, she heads a microbiology lab and teaches at Yale University as a Howard Hughes Medical Institute professor of molecular, cellular and developmental biology. She is a pioneer in the study of metagenomics, which is closing the gap between medicine and agriculture. She received the Presidential Award for Excellence in Science Mentoring in 2011, particularly for her work in helping women and minorities in STEM succeed. Somehow, one of the most inspirational and powerful people in the world graciously agreed to an interview with me when I was in DC this past April. What made you get interested in your career? A microscope. I was in seventh grade and my science teacher showed us how to use microscopes. I never wanted to stop looking through a microscope. I didn’t want to go to my next class. I didn’t want to do anything else. I saved up money babysitting for about six months and bought myself this really old microscope. A 1939 German hospital microscope from pre-WWII. I still have it. I spent most of my teenage years looking at pond water and crystals and all sorts of things. Eventually, I became a microbiologist. A lot of scientists say they have a mentor they found and that’s what kept them on their path. Did you have a mentor like that? Not one, but I think I had some critical people that kept me going. One was a tenth grade biology teacher who just called me out into the hallway one day and told me I was really good at biology and that I should stick with it. No teacher had ever said anything like that to me before! Later on, where I was an assistant professor, it was such a cold, unfriendly environment. It was still a time when people denied there was any sexism or prejudice in the department that I was in. Every time any of these events would happen that just made me think, “Do I really belong here?,” there was one person in the department who would assure me that I did. To this day, I’ve always been grateful for that kind of support. What makes a good science mentor? Or just a mentor, in general? I think it depends on the situation and the relationship. Some of the general principles are that you’re mentoring the person to do what they want to do, not what you want them to do. It sounds really obvious, but a lot of people have set notions of what a scientist is or what a scientist should do. Also, you have to be open-minded to people’s abilities to grow beyond what you think. That’s something I had to learn. I thought I was a really good judge of students and how far they’d go, and I was wrong so many times. It’s a delight when you’re wrong. I’ve learned to give people the benefit of the doubt in mentoring. If they said they want to do it, that’s all it takes in this world. Just wanting to do it. You’re a huge advocate for women in STEM. Why do you think a lot of women feel discouraged from STEM careers, particularly academic positions? I know it’s started to change. It’s changing, but not fast enough. I think there are a lot of messages that women get that discourage them from STEM careers. Some that we know about are the media messages. They don’t see people who look like them—just normal women that they might want to be being STEM professionals—in television or movies. Another reason is we all carry subtle biases that shape our opinions of people and how we treat them and how we evaluate what they do. All of that comes from stereotypes embedded in our brains from over a very, very long time. Men and women do the same thing. Research shows that it’s not a conscious thing men are trying to do—it’s not anything like that. It really is subconscious, which means that it’s pretty equally distributed among people. The result, I think, is that girls and women get some very subtle, but powerful, messages that tell them that they’re not as good as boys. One study showed, for example, if you ask parents of teenagers how good their kids are in math, the parents will essentially overrate the boys and underrate the girls of exactly the same capacity. If you ask teachers about computer science abilities, they’ll say it’s inborn, that they know it when they see it, and of course, they only see it in boys. So, you can just imagine the cumulative messages over decades as you’re growing up and then trying to become a professional; it’s no wonder why they dropped out. In fact, I find it remarkable that any women stay in, given how much tougher they have to be. You look at the messages that boys and men get and it’s just constant reinforcement: “Of course you can be a STEM professional. Of course you can be a scientist. Scientists have looked like you since the beginning of time.” It almost makes it look easy. I know it’s not easy for anyone, but it almost makes it look easy to get that kind of vigorous support, which girls just don’t get. My mom always tells me that I have to be twice as good to get just as far. Unfortunately, that’s good advice. It’s sad, but true. After hearing about Rosie, Dr. Handelsman gifted me one of the cutest pins I have ever seen. One thing I really care about is science literacy. I don’t really care if my friends can spout out astronomy facts, but I do care if people are sharing articles they’ve only read the headline of. As someone gaining a science background, it really bothers me. How do you think we can create a more science-literate population? We can change the way we teach science in schools and in college. We can make sure people aren’t just asked to memorize or use information in a rogue sort of way, but rather evaluate information and do what a scientist does, which is discover new things. If people have ever been through the scientific process—developed an idea, tested it, experimentally, and analyzed the data—I think they’ll be more critical every time they read the newspapers. I believe very strongly in getting people to behave like scientists. This is going to sound pretty blunt, but how do you deal with science illiterate people? People who are anti-vaccine or deny climate change? You have a right to your own opinion, but when that opinion now hurts others, it’s different. Especially in your position, I imagine it’s hard to work with science illiterate people. It is, and I have to be very careful because there’s a fine line between politics and policy in science. Our general policy is to stick with the science and explain it as clearly and simply as you can. There are some people who just won’t be swayed. You have to accept that ahead of time, but you hope that by presenting the arguments well, you help make people science literate. Exactly! To scientists, that’s the ultimate. “Oh, you’ve got the data? Well, I was wrong.” It’s that simple. That’s how it is in this White House, because the President is so data-driven and so evidence-based that if you can make the evidence-based argument, they’ll come to your side of the argument. It’s just not like that in the rest of the world. A lot of people are persuaded by evidence, and a lot of people think scientists are respectable people, but there are people in Congress and the rest of society who just have absolute contempt for people who “believe” in climate change. I hate that phrase. “Believing” in evolution or climate change—No. I’m persuaded by data. I don’t believe in anything. What’s your greatest concern for my generation? I’ll give you two, but I will say that I think your generation is in great shape. There have been generations, periodically, that haven’t been so encouraging, but your generation is so idealistic and eager to make the world a better place. I think that’s all it takes. The two big ones that come to mind are climate change and soil loss. Climate change, as I’m sure you know, is pretty bleak. We’re not changing fast enough, but with activism across the world from young people, we might be able to change things faster. Soil loss is actually easier to fix, because we know exactly what to do stop soil from eroding. We are eroding soil currently at such a high pace that, by the end of the century, we won’t have any soil left to grow crops on. That’s true here, it’s true in India and China, and it’s eroding much more quickly in some other countries. As climate change gets worse, the weather will get more and more intense. Storms, in particular, are terrible for soil loss. The momentum with which the raindrops hit the soil affects the structure of the soil. In turn, the soil erodes quicker. We just have to get on this right away, but most people don’t know about it. It’s as serious as anything we’re facing, because it’s so immediate. If we don’t have soil, we don’t have food. People don’t know about this, but if they did, they would purchase food based on whether it was grown in a soil-sustainable way. They would compost. They would make sure they were buying food from farmers who took protective measures. We know how to take soil erosion down to 5% of what it is now if we wanted to, whereas climate change is so overwhelming. It’s so big, and, in some ways, it seems so insoluble. Soil loss is a lot easier. I guess, lastly, I want to ask you how I can become a better scientist. Do you have any general advice for undergraduates? Do research. What ignites the spark in most scientists is being engaged and generating new knowledge. A lot of us live for those moments where we are the only person in the world that knows this little nugget of nature. It may be the tiniest thing, but, for that instant, before you tell someone else, you know something that’s never been known before. That’s just incredible and it carries you through the hard times. Science is hard. We’re not told that it involves a lot of failure. I wish I had been told that, and I wish I had told more students that. Women, especially, tend to blame themselves and think that they’re not good enough. When I was in college, my grades in science weren’t as good as my other grades. I thought, “I’m not as good at this.” I decided to go through with it, because I loved it, but it took me years to figure out that it wasn’t because I wasn’t good at science. It was that some subjects are easier than science. It’s not a popular thing to say, but there are simply some disciplines that are harder than others. Science is about failure. If you’re not failing at some of your experiments, then you’re not reaching far enough. You should be failing. Hypotheses should be wrong. Why do the experiment if it’s always right? Although intended for teachers, if you’d like to read Dr. Handelsman’s book, “Biology Brought to Life,” click here. If you want to get involved with science policy or learn more about the OSTP, you can email scheduling@ostp.eop.gov or visit the website. If you want to learn more about soil erosion, you can watch this episode of YNT. If you care about wanting your grandchildren to have food, contact your elected officials and ask them what's being done. If you're in Oregon specifically, send me an email and let's see what we can do together!